Free-to-play historical online game Total War Arena will be shutting down next year. That's according to a blog post on the title's website, in which developer Creative Assembly said that the title would be closed in February of next year. This follows an open beta, which did not meet the expectations of the studio. "Arena has been on a long journey, and we are thankful to everyone who joined us," Creative Assembly developer communications bod Joshua Williams said. "We have learned so much during the development of Arena and we have grown incredibly close with the community and involved you deeply into our development process. It has been an absolute privilege to work with you all on this project, but unfortunately the results of Arena Open Beta Test did not meet all our expectations. "I would like to take a moment to thank the Arena Team, who have poured their heart and soul into this game’s development and are just as disappointed by this as you. "For those of you wondering about the team, they will all continue working on Total War, sharing their experience and learnings from ARENA. ARENA’s technological advancements will continue to be part of Total War development going forward. "To you, the players and community, I have been inspired by your passion, your commitment and your continued valuable insight. Your input and encouragement have been instrumental to the game’s development. I cannot emphasise enough how much we have enjoyed working and playing with you all, and I know that we will greatly miss speaking with you online, debating your feedback, and fighting alongside you on the battlefield." 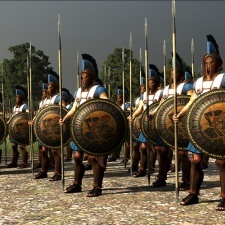 Total War Arena was announced back at GDC 2013. Not much was heard about the game until the end of 2016, when publisher Sega revealed that it was teaming up with World of Tanks firm Wargaming to run the title. This was the debut title in Wargaming's brand new Alliance publishing label. Speaking to PCGamesInsider.biz at Gamescom 2017, Wargaming boss Victor Kislyi says that this new venture was a way of supporting smaller developers, as well as hedging its bets on where the next big thing was coming from. In other Total War news, we recently caught up with Creative Assembly to talk about the latest entry in the franchise, Three Kingdoms.